You are here: Home � All Deals , Savings: Freebies Coupons Giftcards � 40% off of everything at Kenneth Cole - Today only, free shipping on orders over $100. 40% off of everything at Kenneth Cole - Today only, free shipping on orders over $100. 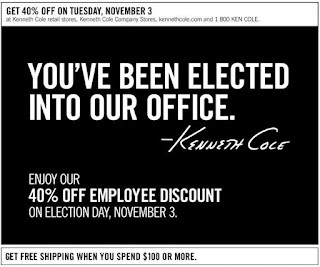 To celebrate election day Kenneth Cole is offering a 40% employee discount on almost everything in there online store. The coupon also says in the fine print that their retail stores are also participating in this sale. Though as always it never hurts to call and double check before venturing to the brick and mortar locations. You can visit their site by clicking here. Remember this is one day only.